Another fascinating photograph from our regular contributor Cicos Florin in Constanta by the Black Sea (Romania) who is interested in old cars of Romania. Do we know what this is? -- From steering coloumn immediate thought was De Dion Bouton, but it has a front mounted engine with starting handle, plunger suspention and a high front rad. Our Ariejan Boss advises this is a very rare image of a cca 1901 Braun Vis-a-Vis / Voiturette, produced by August Braun & Co Vienna, Austria. 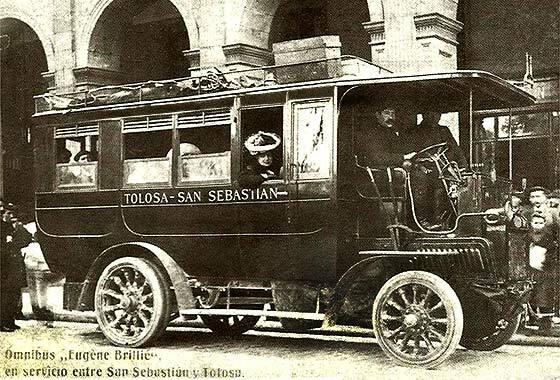 Another vey interesting photo received from Iñigo Agirre Ibarbia (Spain) of a coach on the Tolosa-San Sebastián line. This is picture from a Facebook group devoted to history of San Sebastian Desaparecida in Spain. Guess from a member that it is a 1903 Fiat 24 HP? -- The answer is on the photo. This is a cca 1906 Eugene Brillié P2 35 HP Coach of the type widely used in Paris 1906/1911. Eugene Brillié was part of Gobron Brillié, staring own EB company in 1904, then became Brillié-Schneider. 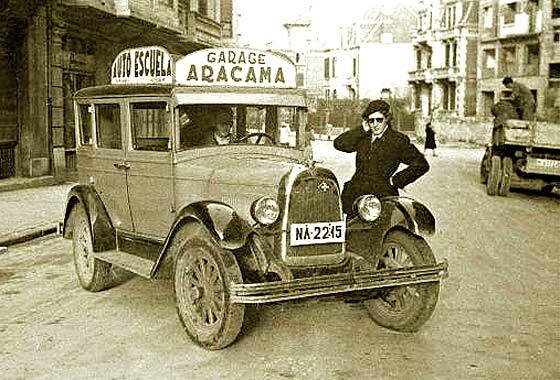 A couple of interesting photos received from Iñigo Agirre Ibarbia (Spain) of a car owned by his grandfather Eugenio Ibarbia Gabirondo. Mother remembers something like Picard Piqué, so it is probably Piccard Pictet. Plate SS 6(? )04 stands for San Sebastián, capital of Guipúzcoa in Spain. -- Indeed a cca 1911 Pic-Pic 18 Landaulette made by SA Piccard & Pictet et Cie of Switzerland initially marketed by S.A.G., Geneva. Piccard & Pictet Cie first made Hispano Suizas under licence. Another interesting photo via Iñigo Agirre (Spain) from a Facebook group devoted to history of San Sebastian Desaparecida in Spain. Could we advise make of vehicle? This one: Guregipuzkoa.net; San Sebastian. -- Quite a few cars in period had coal scuttle bonnets and Renault kept them the longest. Renault also had a plethora of models with letter definitions, some which only define difference in length. This one has solid sides to radiator suggesting cca 1911 Renault A Series Limousine. 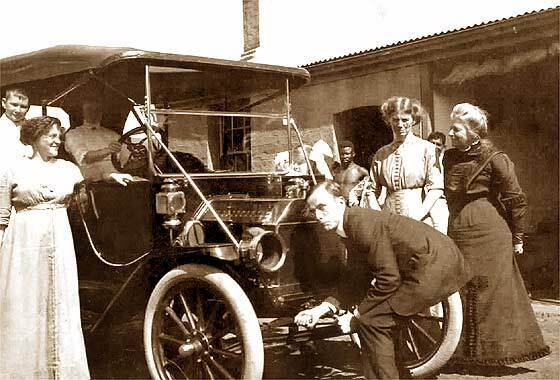 This photo taken taken near Durban, South Africa between July and Dec 1912 and was sent to us by Warren Taylor of Sevenoaks (UK) asking if we could identify this vehicle. It does look like a Ford of sorts, but he cannot be sure. 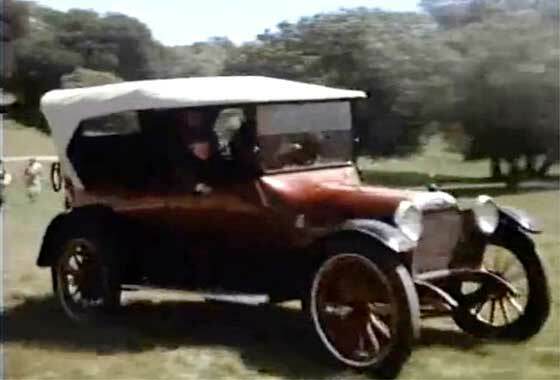 -- This is a indeed a Ford and it is a Model T. Dating features do seem to agree with the date of the photo as car has front door (introduced mid 1912) and has a lip/bill on the front mudguard (gone by 1913), all suggesting this is a cca1912 Ford Model T 5P Touring. 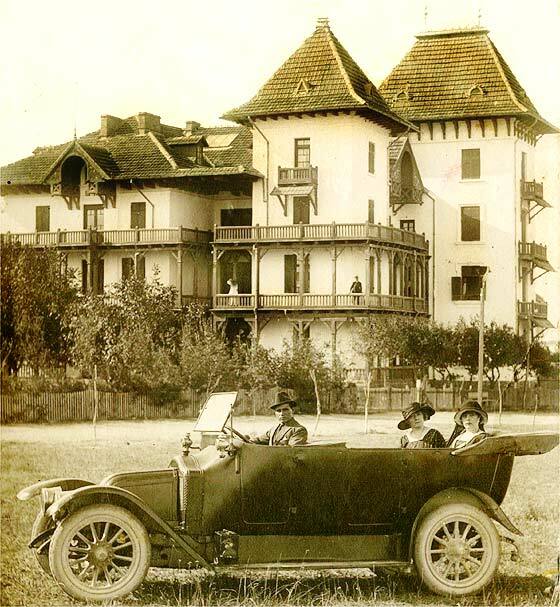 Another fascinating photograph from our regular contributor Cicos Florin in Constanta by the Black Sea (Romania) who is interested in old cars of Romania. Do we know what this is photographed in Techirghiol? -- From the coal scuttle type bonnet this is a French Renault. 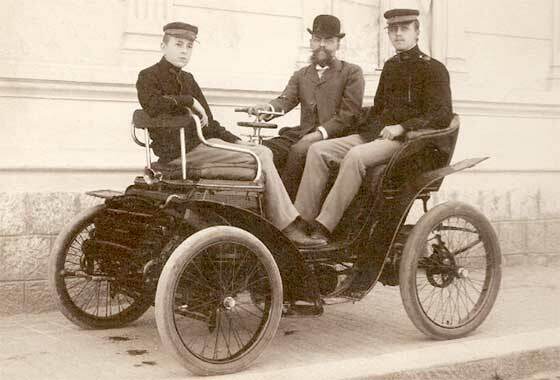 Renault started in 1899 making a voiturette powered by a De Dion Bouton engine. We are relatively sure this one is a cca 1913 Renault CQ / DM Torpedo. The body is unusually high, and only one filler cap on scuttle. Cinema screen grab taken from an American made-for-tv film 'The Blue Yonder' made in 1985, where cars are being investigated by IMCDB. Science-fiction adventure about a boy accidentally sent back in time from 1985 to 1927 by a time machine and must find a way to prevent his grandfather's fatal attempt at solo trans-Atlantic flight. -- This car was made in Pontiac, Michigan, USA by a company founded in 1907, and sold to General Motors in 1909, a c1916 Oakland 32B Touring. 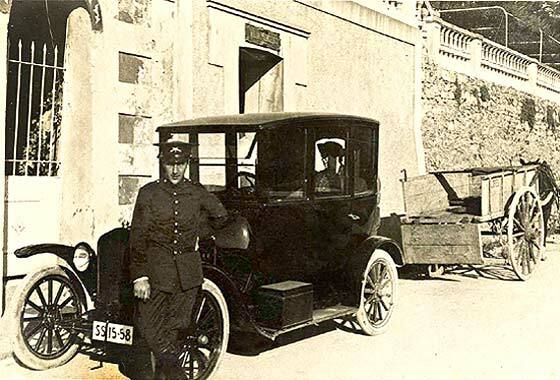 A couple of interesting photos received from Iñigo Agirre Ibarbia (Spain) of a car owned by his grandfather Eugenio Ibarbia Gabirond who is standing beside the car. Can we identify the vehicle? -- This is a big car manufactured in Torino, Italy having six cylinders of 3446cc producing 46HP, and a four speed gearbox. This is as cca 1919/20 Fiat 510 Torpedo fitted with a lightweight body and substantial hood and sidescreens, and was the first/largest car in the post WW1 Fiat range. Interesting photo received from Tim Taylor Wright (UK) asking if we could identify this vehicle from possibly around 1910 to 1930. First thought was it may be a model T Ford but then thought differently. The picture is supposed to have been taken in London. -- Not American but French! This is a cca 1920 Citroen Model A Torpedo made in Paris. 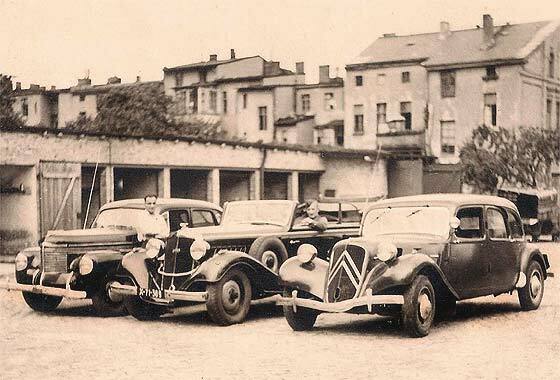 Citroen were widely available in UK from the start 1919, and were later built in Slough. 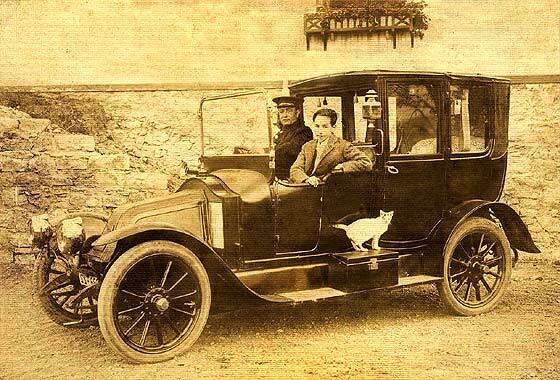 This is an early A car and is fitted with British sidelights. Another interesting photo via Iñigo Agirre (Spain) from a Facebook group devoted to history of San Sebastian Desaparecida in Spain. Could we advise make of vehicle? This one is Guregipuzkoa.net; In front of Villa Mercedes. Martutene in San Sebastian. c1920. -- American car built in Detroit. This is a cca 1921 Ford Model T Center Door Sedan. Only had two doors one centrally each side. Introduced in 1917 and then again in 1921. 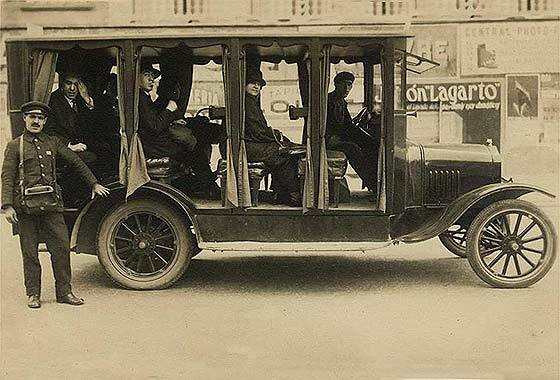 Difference is that '21 car, as this one, had no cowl lamps. 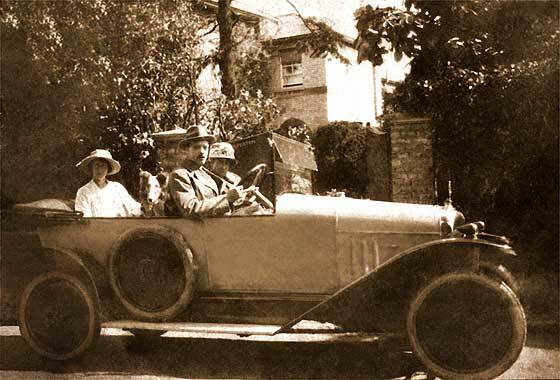 Interesting photo received from Mark Rutter (UK) found by his aunt of his Grandparents and uncle taken in grandfather's car in 1928. A family member thinks it might be a Webb made in Birmingham. -- Very unique car made by V P Webb, of the seed family, who looked at motorcycles but went into cars in Stourport, Worcs. This is a 1922 Webb Super Nine Chummy. 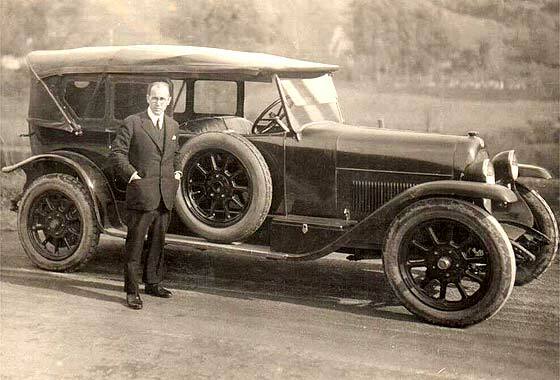 Only about 97 cars were made 1922/23, 1088cc Alpha SV engine, Moss gearbox and back axle, 40-50 mph, 40-50 mpg, £225/75. Another interesting photo via Iñigo Agirre (Spain) from a Facebook group devoted to history of San Sebastian Desaparecida in Spain. Could we advise make of vehicle? This one is Kutxateka /Foto Car/Ricardo Martin; Weighing Bloch's car at the harbour for the Gran Premio de Turismo de Guipúzcoa. 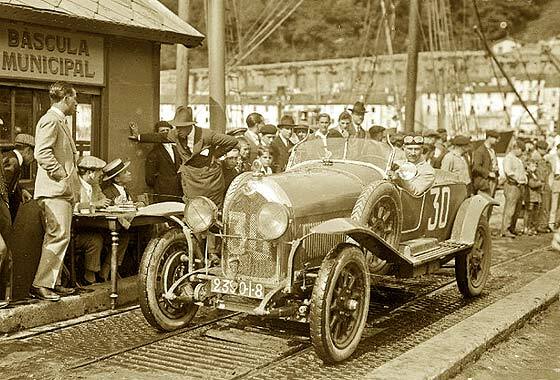 -- First thought British Crossley, but as Bloch, Robert Bloch, was a French racing driver who won the 1926 Le Mans 24 Hour Race in a Lorraine Dietrich, this is cca 1925 L-D B3-6 Sports Tourer. Another interesting photo via Iñigo Agirre (Spain) from a Facebook group devoted to history of San Sebastian Desaparecida in Spain. Could we advise make of vehicle? 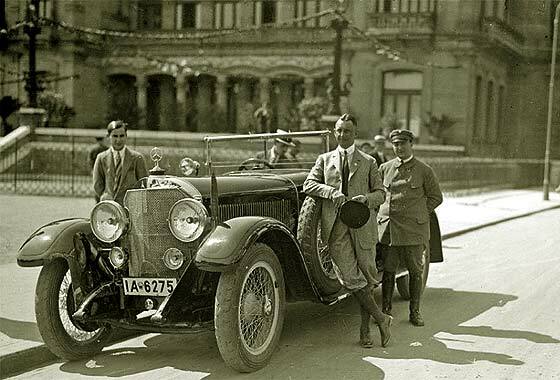 This one is Kutxateka /Fondo Foto Car/Ricardo Martin A Mercedes in front of the Casino of San Sebastián in 1926. -- Not a Mercedes Benz but probably a cca 1926 Mercedes 24/100/140 PS designed by Paul Daimler and manufactured by Daimler before they merged with Benz. Thereafter it became a M-B 630 to 1929. Another interesting photo via Iñigo Agirre (Spain) from a Facebook group devoted to history of San Sebastian Desaparecida in Spain. Could we advise make of vehicle? 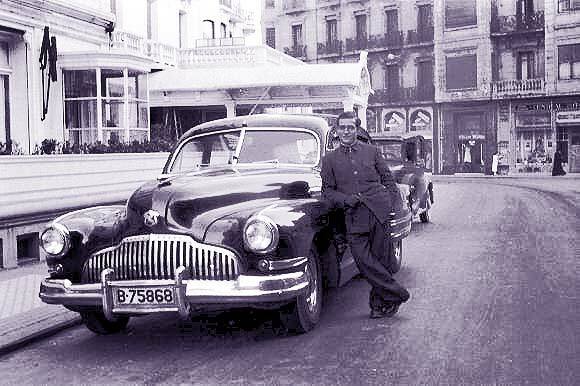 This one is Kutxateka /Fondo Marín/ Pascual Marín Driving school car. San Sebastian. c1940 . -- American car built in Toledo, Ohio. This is a cca 1927 Whippet Coach, separate entity but built by Willys-Overland and having European look due input from the UK W-O-Crossley Ltd. "The world's lowest priced six" at $700. Another interesting photo via Iñigo Agirre (Spain) from a Facebook group devoted to history of San Sebastian Desaparecida in Spain. Could we advise make of vehicle? This one: Kutxateka /Fondo Marín/ Pascual Marín; At the Boulevard of San Sebastian. c1930. -- American made lorry. This is a cca 1930 GMC (General Motors Truck) One-ton Truck. GMC was a division of General Motors which merged some of the earliest truck manufacturers, introducing the GMC Truck commercials in 1912. 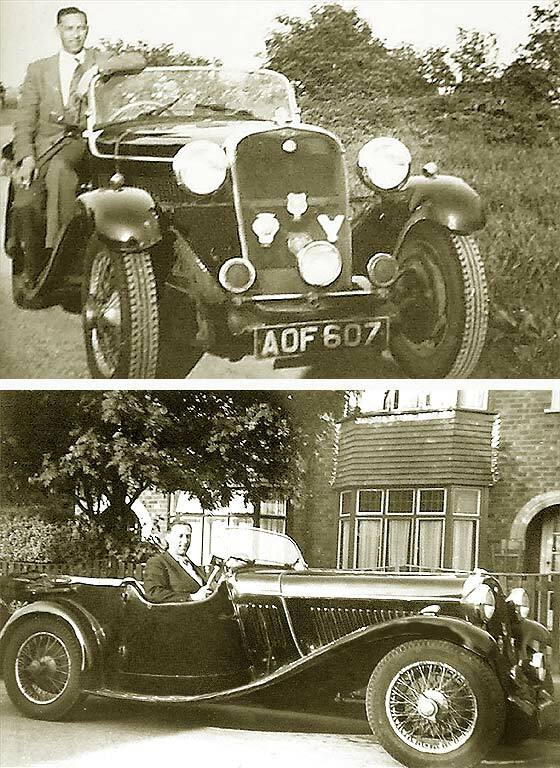 A couple of interesting photos received from Adrian Jobing of car owned by his father. Adrian lives in Sydney, (Australia), but photo was taken in UK. -- Numberplate AOF 607 was a registration issued by Birmingham County Borough Council. Five rear louvers, quite a rare car; only 77 made, this is a September 1934 Singer 1.5L Sports Tourer. 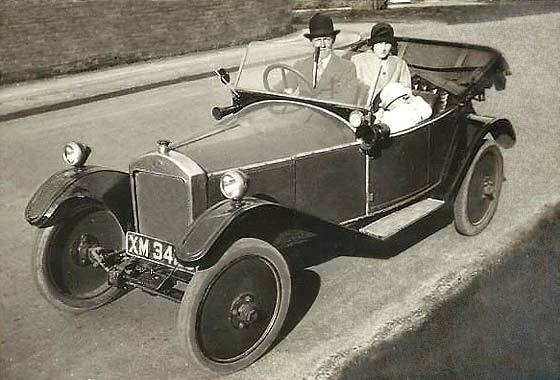 Made to compete with MG and Lagonda, it was fitted with a 1493cc sic cylinder OHC engine and four speed box. Capable of 60-70mph. Priced at £ 295. Another interesting photo via Iñigo Agirre (Spain) from a Facebook group devoted to history of San Sebastian Desaparecida in Spain. Could we advise make of vehicle? 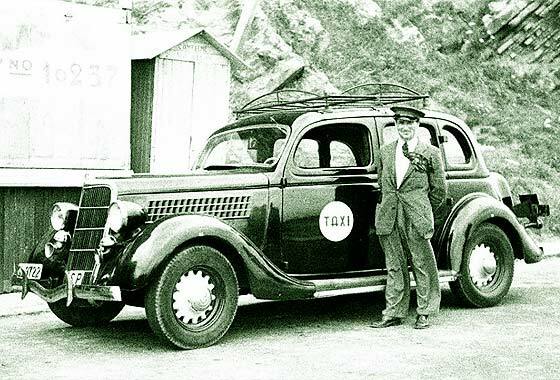 This one is Kutxateka /Foto Car/Vicente Martin, Taxi San Sebastian 1947. -- American car built in Detroit. This is a cca 1935 Ford V8 Model 48 DeLuxe Fordor Sedan. Dating is from there being no cowl side lamps, the grille and the checkered bonnet louvres, only in 1935, and because of external twin horns, it is a DeLuxe Model. Number of interesting photos sent to us by Andrew Kostin from Moscow (Russia) who is a collector of old photos. 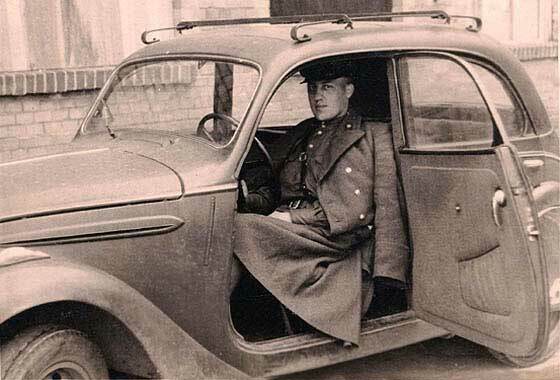 Can we identify this photo of a vehicle photographed in the USSR at the end of WW2. -- A French car made by a company which had initially specialised in pepper mills in Sochaux on the border with Switzerland. From the single bar louvre this is a Peugeot 202 which were made 1938-42 and 1945-48. From the front wheels just visible this is a cca 1938/9 Peugeot 202 4-door Saloon. Number of interesting photos sent to us by Andrew Kostin from Moscow (Russia) who is a collector of old photos. Can we identify this photo of vehicles photographed in the USSR at the end of WW2. -- A German cca 1939 Opel Kapitan Saloon, a German cca 1939 Horch 830 Cabriolet and a French cca 1939 Citroen Traction Avant but the rather special stretched version, the 11B or the 15 Familiale with a messy added rear window each side and three rows of seats for nine persons, introduced in 1939. Another interesting photo via Iñigo Agirre (Spain) from a Facebook group devoted to history of San Sebastian Desaparecida in Spain. Could we advise make of vehicle? This one is A Buick? c1950. -- American car built in Detroit by a division of General Motors which had originated as Buick Auto-Vim in 1899 by the Scottish engineer David Dunbar Buick. From seemingly two side windows, and two trim strips on the mudguard and two on the door, this is a cca 1942 Buick 51 Six Passenger Sedan. Another interesting photo via Iñigo Agirre (Spain) from a Facebook group devoted to history of San Sebastian Desaparecida in Spain. Could we advise make of vehicle? 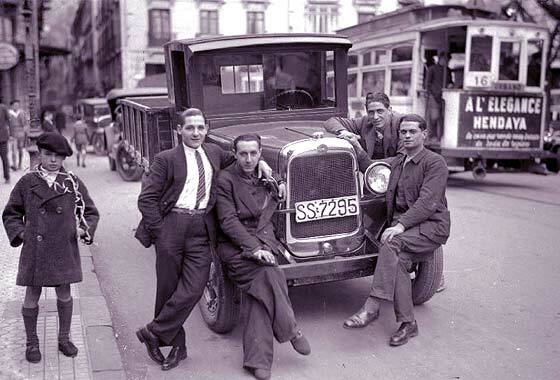 This one is Kutxateka/FotoCar/ Vicente Martin Ondarroa-Bilbao coach in San Sebastian. 1946. 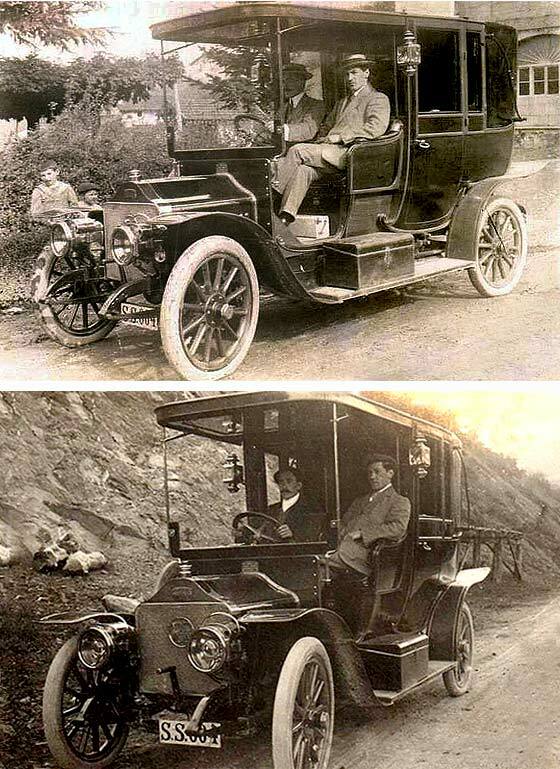 -- Vehicle made in Switzerland by a company founded in 1902, purchased by British interests 1908, eventually purchased by Saurer in 1912. 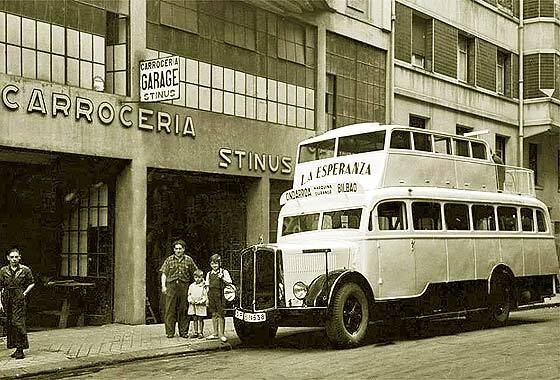 This is a cca 1947 Saurer-Berna Coach but possibly with second deck added in Spain. Photo of this rather nice car snapped by Simon (Barbados) who wants to know what it is. -- This is one of a very few cars manufacturers who were based in Kensington, London. Started as a result of a chat in 1945 between a Director of Fraser Nash-BMW and the Bristol Airplane Co who were interested in making a sports car. 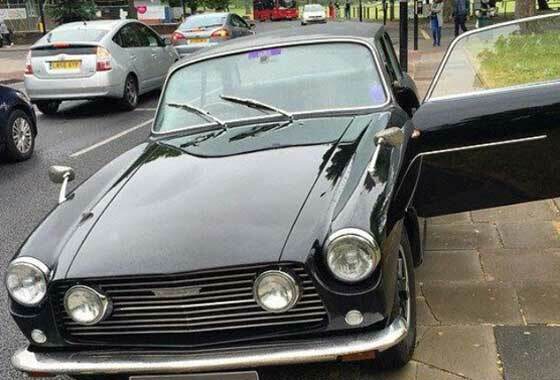 Exciting cars followed, and this one has a badge in the grille chromework, saying it is a cca 1970 Bristol 411 Sports Saloon, registered Greater London C C. 600 '411' cars made. 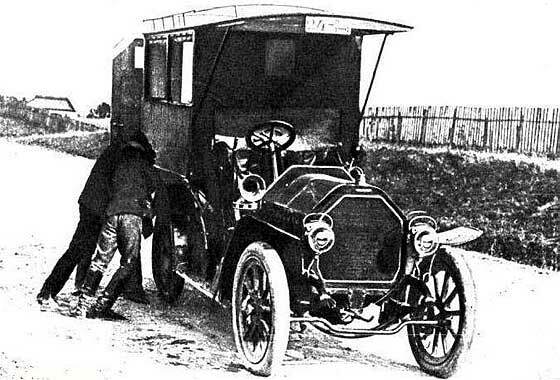 Puzzling photo of unknown vehicle photographed in post 1907 in Kiew, Ukraine, sent in by Igor Glazman, Moscow, (Russia). This has been discussedat great length in Russia and on Russian local forums. Lots of hypothesis but no positive answers. Perhaps a custom radiator? -- Photo has done the rounds of our UK and overseas experts but also no positive identification here either. Suggestion of Aries or Vinot & Deguingand but neither seem to fit. If anybody has idea, HELP PLEASE! Number of interesting photos sent to us by Andrew Kostin from Moscow (Russia) who is a collector of old photos. 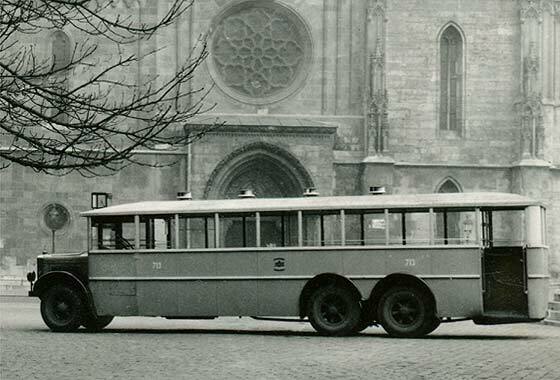 Can we identify this photo of a vehicle photographed in Germany by a Russian soldier, end WW2 -- We contacted our German contributor Raoul Rainer who suggested the bus had a three pointed star rad mascot. I thought it was a temperature gauge. If he is correct, he suggests this could be a cca 1939 Mercedes Benz Type O 4000. As we could not get enlarged photo, HELP PLEASE !